It's Saint Patty's Day weekend and you know what that means.... Shepherd's Pie! You might be thinking there is no way we could turn this typically fattening dish into a healthy delicious meal for just over 300 calories! Well we did it and it was well received by all :) 'If people try out this dish, there are going to be a lot of happy husbands out there ' - a direct quote from the hubs happily eating ;) So take his advice and make this one for your whole family! We start out by swapping the traditional white potatoes with sweet potatoes for higher nutritional value and more flavor! 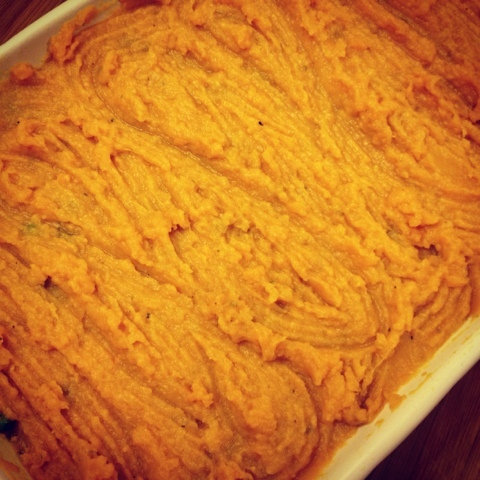 We feel when using sweet potatoes less butter and milk is needed because of the already sweet and tangy flavor. We mashed our potatoes with a meer tablespoon of butter and a quarter cup of non-fat milk! Not too shabby huh ;) To make our ground meat mixture we thought we would hide in veggies galore. This is a great little tip if you are feeding picky eaters, cut the veggies small enough and the kids won't even know they're in there! 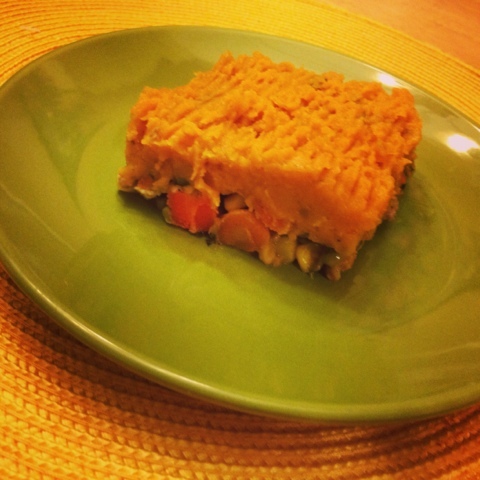 We choose to use carrots, leeks, zucchini, mushroom and frozen corn and peas! Use a mixture of whatever you have on hand, any combination will do. Simply saute up and then add in your 93% lean ground turkey, 2 cups of sodium free chicken stock and just a hint of whole wheat flour to thicken up! It's as simple as that and doesn't it just sound healthy? Now slice up this pie and get eating! 3. Mash when softened (with hand mixer or by hand) with one tbsp butter and 1/4 cup skim milk. 5. Add ground turkey and cook until browned. Add 2 cups sodium free chicken stock and add frozen peas and corn to the mixture. Add chopped parsley and one tbsp whole wheat flour and cook for approx ten minutes until mixture begins to thicken. Looks so yummy! 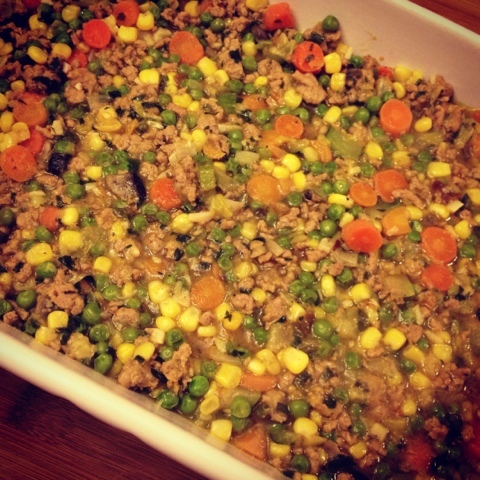 Shepard's pie is one of my hub's favs - I'll have to try this! Hello new follower over here!! I found your blog off of Ashley Ella Desing :) She designed my blog to. Glad i found your blog, was in need of some yummy healthy recipes! Thanks so much! Let us know what you think if you try the shepherd's pie!